On Monday, September 3, 2007, during an afternoon press conference at the 22nd EU PVSEC, Oerlikon Solar had a trio of announcements. First, with Oerlikon names Jeannine Sargent CEO of Oerlikon Solar to further expand enterprise, Ms. Sargent became the first Oerlikon Solar CEO in charge of all solar related businesses within Oerlikon. Detlev Koch-Ospelt remains the Head of Thin Film product solutions. Next, Oerlikon Solar introduces production solutions for technologically advanced micromorph tandem modules was the formal introduction of micromorph technology by Oerlikon Solar CEO Ms. Sargent. 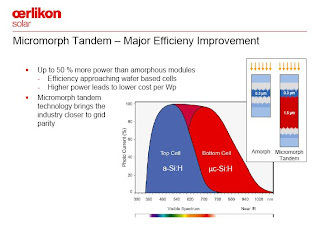 By adding a 1.5um microcrystalline silicon bottom cell below the amorphous silicon top cell, the micromorph tandem module delivers up to 10% module efficiency at costs of less than $0.70 per Watt-peak with 100+ MWp (MegaWatt-peak) scale Fabs all by 2010. Inventux Technologies AG was announced as the latest customer for a 33MWp micromorph tandem module production line from Oerlikon Solar. Inventux presented plans to ramp the 33MWp Phase 1 line in 2008 and expand capacity to 100MWp in 2009. Inventux will locate the new facility in southeastern Berlin near Berlin – Adlershof, Germany, very close to the new Berlin Brandenburg International (BBI) Airport. A few days before the Oerlikon Solar press conference, ersol Solar Energy AG (FRA:ES6) issued a stealth press release, ersol prepares for the next generation of thin-film technology (Deutsch) late Friday afternoon, August 31, 2007. Translating the PR speak, this should have been titled “ersol cancels amorphous silicon (A-Si) module production and accelerates production of micromorph tandem modules”. Now I only stumbled upon the ersol news a few days later when I was checking into the Financial Times report about Oerlikon Solar discussed in the following segment. A quick visit to the ersol stand at the 22nd EU PVSEC Exhibition began the clarification process. While I was able to check the basic facts with Dr. Christian Koitzsch, Group Manger Silicon Material, he didn’t shed much light on the root motivation for the decision. The 40MWp ersol Thin Film factory was categorized as a prototype factory and the move to micromorph was explained as a necessary step to develop a competitive copy exact platform for further capacity expansions. Dr. Koitzsch did confirm recent management turnover at ersol Thin Film. So what are the real motivations for ersol to delay production until 2008 after investing €80 Million in a new facility? I have to believe customers have balked at 6% efficiency modules for large scale solar power plant applications because of price per Watt and balance of system (BOS) costs. First Solar CdTe Thin Film modules have established a price per Watt cost leadership position in the large scale, grid connected, solar power plant application segment. Oerlikon Solar has pulled in delivery of micromorph tandem equipment creating an opportunity for new turnkey customers to start production with micromorph and placing ersol Thin Film at a disadvantage. Management changes at ersol Thin Film brought the usual review and reevaluation of the business unit’s strategy. It is unclear if the management turnover correlates to this decision or is an asynchronous event. I planned to take Oerlikon Solar to task for failing to mention the ersol news. However, I have heard they were also caught off guard by the timing of this development just before the press conference. I received this Google alerts shocker along with the Advent Solar layoff news. In consulting with Oerlikon Solar folks at their EU PVSEC stand, they were as surprised by this one as I was. Reading this article, could the company source here even be the same company spokesperson prodded to answer a series of leading questions? Although I have to assume FT has a credible source for such a hyped assertion, I believe FT took their cue from the organization of solar related business under Ms. Sargent in the new role of CEO Oerlikon Solar. This move telegraphs a first step to make the Oerlikon Solar business unit self contained and separable. Further speculation in the article about potential buyers demonstrates a clear lack of insight into the Photovoltaic Industry and value chain. I see OC Oerlikon Corporation AG (VTX:OERL) committed to and making long term oriented investments in Oerlikon Solar and the solar production equipment space with great individual enthusiasm. Solar represents a lucrative, high growth business segment Oerlikon needs to drive their future growth. For corporate purposes, it could make sense for Oerlikon to monetize the value of the Oerlikon Solar business in a market receptive to solar IPOs. Oerlikon could IPO the Oerlikon Solar business while maintaining majority share ownership and control a la Cypress Semiconductor and SunPower. This IPO approach would drive more value for Oerlikon shareholders than a simple direct sale =unless= boardroom intrigues impose a different calculus near term. This is a link to some interesting commentary about Oerlikon’s financial position from an textile industry observer. Oerlikon has products for the textile industry from its acquisition of Saurer. If this is accurate, situation for Oerlikon is up in the air right now. Edgar. I think you have a good blog here. Keep up the good work. It is interesting to see what is going on in the field at a grass roots level.